The award was presented at the annual business meeting of the Gustavus Association of Congregations. The Gustavus Adolphus College Association of Congregations (GACAC) recently bestowed the Rev. John D. Hogenson ’81 with the Association’s Covenant Award, which honors individuals who have made significant contributions in strengthening the presence of the College in the Church and the presence of the Church in the College. The award was presented at the 29th annual business meeting of the Association of Congregations. Hogenson was chosen for the award because of his strong contributions to the life and growth of both Gustavus and the Church, most notably for his consistent efforts as an ambassador and leader in strengthening the relational network of GACAC. In addition, he has served on the Gustavus Board of Trustees since 2011, and was a member of the GACAC Board of Directors from 2007-13 and its president from 2011-13. 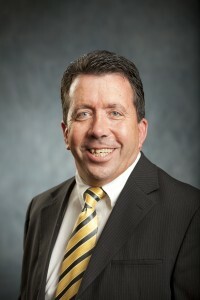 During his time on the GACAC Board of Directors, Hogenson was instrumental in recruiting board leadership, made significant contributions toward long-range planning for the Association, and played a key role and helping design and launch the annual Gustavus Faith Conference, now in its fourth year. He has been a consistent advocate for the church-related identity of Gustavus and was a member of the planning team to establish the Gustavus Endowment for Church Relations. In celebration of all that John and his wife, Ruth ’82, have done for the Church and especially the church-related mission of Gustavus, the endowment that supports the work of the Association of Congregations office will be named in their honor. The John D. and Ruth Hogenson-Rutford Endowment for Church Relations Fund will ensure that the Office of Church Relations will have the funding needed to do its important work for years to come. A native of Owatonna, Minn., Hogenson studied psychology and religion at Gustavus. He earned his masters of divinity from Luther Seminary and is a graduate of the Beeson Institute for Advanced Church Leadership. In his 25 years of ministry he has led a variety of churches, including three of the 10 largest ELCA congregations. He has served at Grace Lutheran Church in Brandon, Minn. (1989-92), Martin Luther Manor in Bloomington, Minn. (1992-94), Bethlehem Lutheran Church in Grand Marais, Minn., and Trinity Lutheran Church in Hovland, Minn. (1994-2000), St. Philip the Deacon in Plymouth, Minn. (2000-07), St. Andrew’s Lutheran Church in Mahtomedi, Minn. (2007-14), and Mount Olivet Lutheran in Minneapolis, Minn., where he has served as senior pastor since 2014. Hogenson and his wife, Ruth Hogenson-Rutford, have three adult children, Kelly, Jana, and Kate, and two grandchildren. For more information on the John D. and Ruth Hogenson-Rutford Endowment for Church Relations Fund, please visit the Gustavus Church Relations website.